How long does it take you—and therefore cost—to pull a study and scan it for use as a competitive PACS study? Do you need your X-Ray file storage space for other revenue generating purposes? Are you looking for a firm with experience in scanning over 1/2 million X-Rays? Someone who clearly understands what it is like to push 6g of Dicom data per day? Someone who has actually used RIS->HL7 to generate a PACS worklist? Someone who understands how to edit Dicom headers? Or someone experienced in storing / compressing / and sending to your PACS? Would you like to not have to explain what PACS, RIS, or HL7 are? All new HP Z-class workstations and servers. 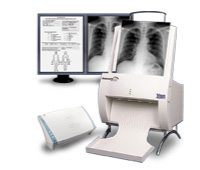 Vidar Diagnostic Pro Advantage X-Ray scanners 2-8k of scanning resolution. We use Merge eFilm (Scan and Workstation), DesAcc Digital Jacket and/or PacsGear PacsScan Film as our scanning control software. The choice is project dependant. Along with various Dicom gateways, and Dicom HL7->Dicom Worklist/mapping products as needed. We can Dicom Send/Push about 6g of Dicom studies per day. All work is scanned by RSNA & HIPPA compliance rules. All scanning work is considered to be used as a first generation diagnostic quality read. Onsite consulting can be provided for the best approach to your X-Ray scanning projects. We provide this outsourced X-Ray scanning service anywhere in the US. To inquire about our services, call toll free: 1-877-342-0690 Dallas, Texas: 972-267-8550, Sherman, Texas: 903-487-0800,or email us at sales@docuworks.com.